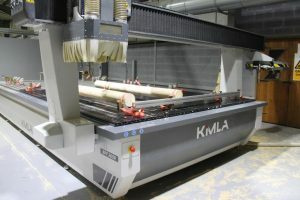 M&M Timber continue to be at the forefront of timber machining technology with the recent investment in a state of the art CNC (computer numerical control) machine. CNC Machining is a process used in the manufacturing sector that involves the use of computers to control machine tools. The new Kimla BPF2650 4-axis router, purchased by M&M Timber, will deliver consistent, high quality, bespoke machining of timbers for the playground and landscaping sectors. 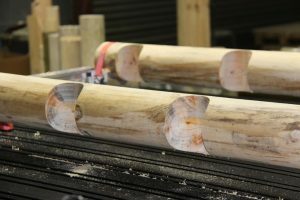 M&M Timber is the UK’s leading manufacturer of machine rounded timber products and part of the Forest Garden Group which have already purchased three Salvador crosscutting systems from Daltons Wadkin for their Lockerbie mill in southern Scotland. For the manufacturing site near Kidderminster, the production requirements are very different with M&M Timber specialising in the manufacture of playground components and landscaping timbers for the education, leisure and commercial sectors. M&M Timber process over 15,000 tonnes of machine rounded timber products for which drilling, end chamfering and scalloping operations have up until now been carried out by conventional means. The purchase of the Kimla BPF2650 4-axis router has however changed all that by enabling accurate and high-speed machining at an entirely new level. The machine incorporates 5000 mm x 2600 mm bed, servo, automatic tool length measurement, 12-position rotary tool changer and a 4th axis C drive amongst its many features, and the new machine is already raising production levels having been delivered, installed and commissioned by the Daltons Wadkin team.